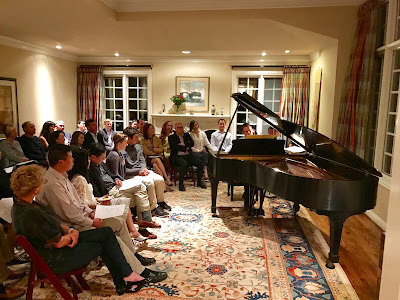 I turned 50 on March 11 and hosted a piano recital for my birthday. My program included Brahms Op. 9, the Schumann Variations, as well as Ballade Op. 10 no. 4. Family and friends attended, who were quite gracious and forgiving of my lack of practice time. Since the recital, I've been working on the rest of Brahms Op. 10. When I was younger, I couldn't get enough of late Brahms. Now that I'm getting older, I'm drawn to his earlier works. I sat down tonight and briefly recorded Op 10 no 1. I need to memorize it and work on the sound (too harsh), but I find this piece enchanting -- from another world, another time.